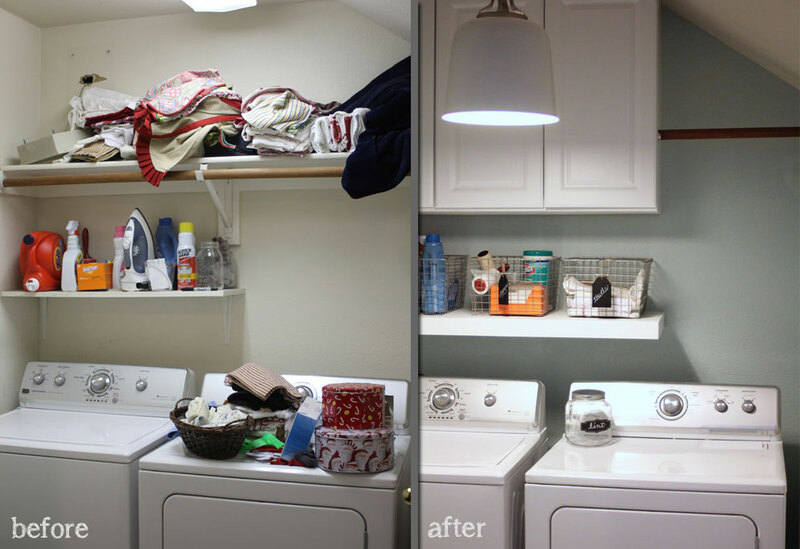 This past week when we were updating the living room, I also got an itch to do an overhaul on our laundry room too. 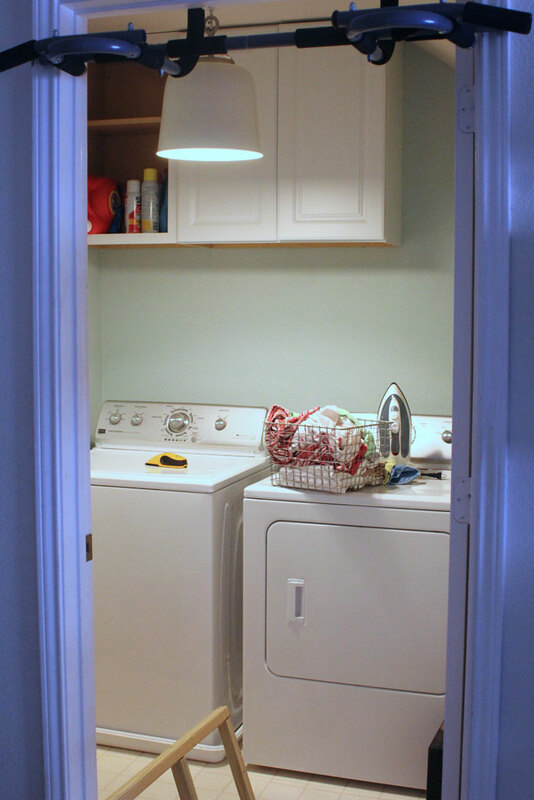 If you read my post a few weeks ago about things I would do the same and differently if I were house shopping again, you know that I have an upstairs laundry room and that I LOVE it. 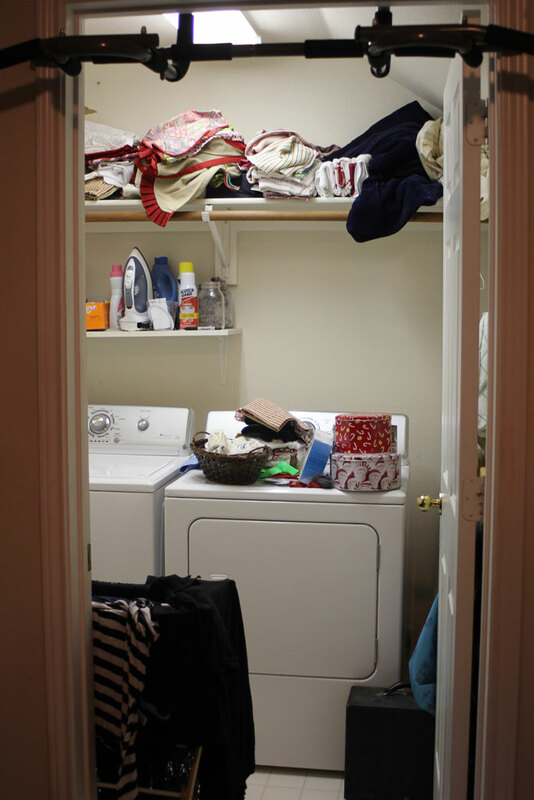 For someone who despises laundry as much as I do, it gives me the opportunity to not have to fold my laundry ever, hide my dirty laundry… nope there is no good way to say that… I just like being able to hide my laundry if people come over. 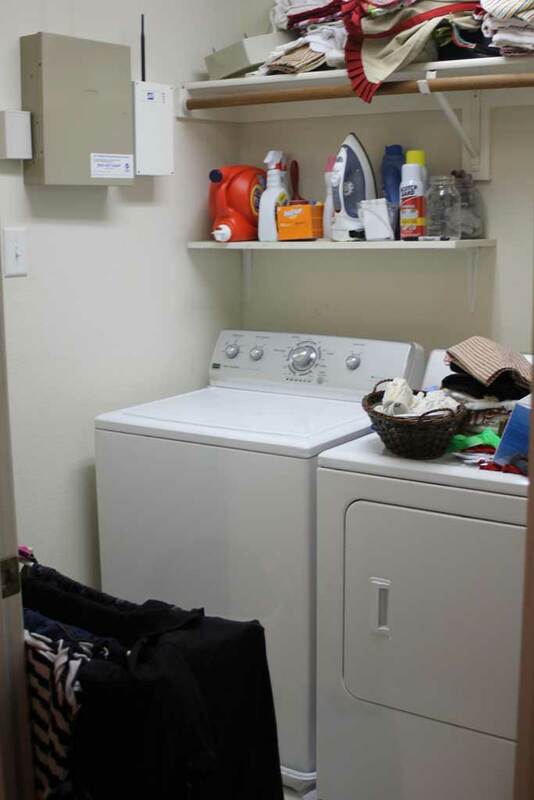 Oh AND I showed y’all an awesome picture of the constant state of our laundry room. Now you see why I had an itch to redo it? Want another before picture? Yes that picture is about a month old, and yes that means I had Christmas cookie tins on my dryer at the end of March. As I tell my husband… BECAUSE I AM AWESOME. First step in a complete overhaul of a junked up room like this? Cleaning it out. 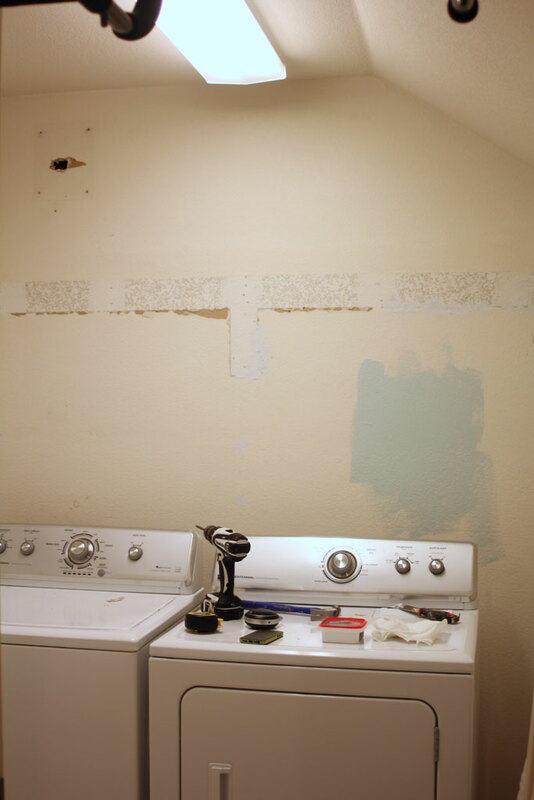 These definitely left a few rough patches on the wall, but fortunately for me, most of those would be covered by the cabinets, but for the ones that weren’t I spread some patch-n-paint over the top of it so it wouldn’t show once it was painted. Then I chose a lovely mint green color Celtic Gray from Behr paint. Its definitely green and not gray. 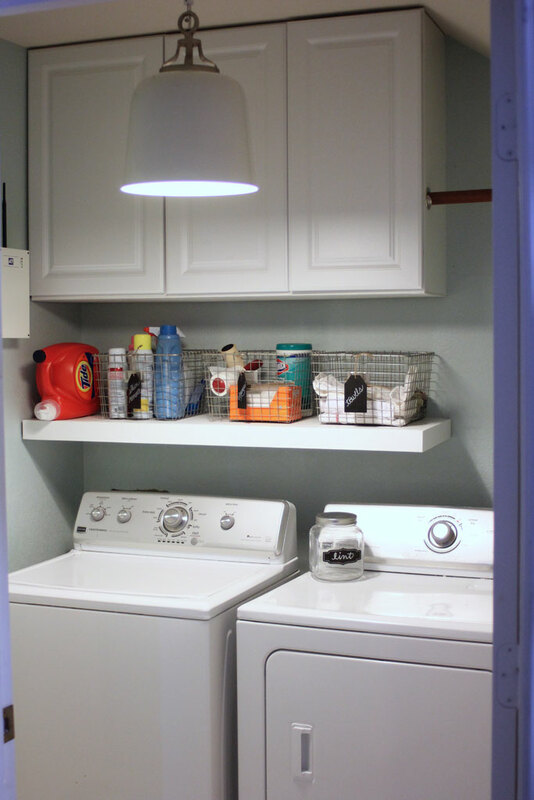 I’m not usually a huge green fan, but decided we could be a bit adventurous in the laundry room. And I wanted it to be very calming and clean. Then the husband and I hung the cabinets as per the instructions on the cabinet box. Do you see the bottom of the cabinets? The cabinets that we bought because they are supposed to hang like that? WHY DO CABINET MAKERS NOT PAINT THAT SPACE THE SAME COLOR AS THE CABINET?!?! Seriously?! 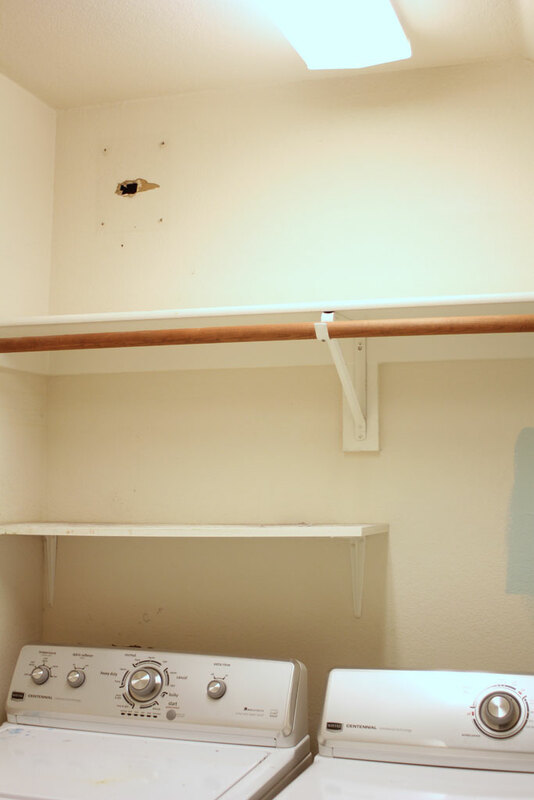 I cut a piece of plywood and painted it white to match the cabinets and then nailed it up, but still… THAT IS DUMB. We also switched out the florescent light for the Declan Light from Crate and Barrel. 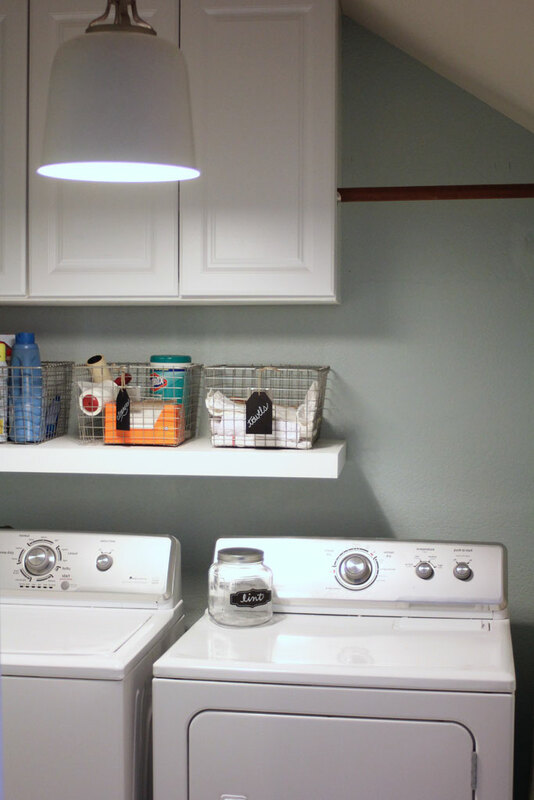 Brief sidenote… I LOVE new and unusual light fixtures, I DESPISE installing them, but I despise paying an electrician to do it for me even more, so…. I suffer. POOOOOOOR MJ. I plan on painting the hanging bar white, but haven’t gotten around to that yet, and our laundry was piling up, so I’m living with the brown for now. I built the floating shelf myself, which I’ll post about next week. 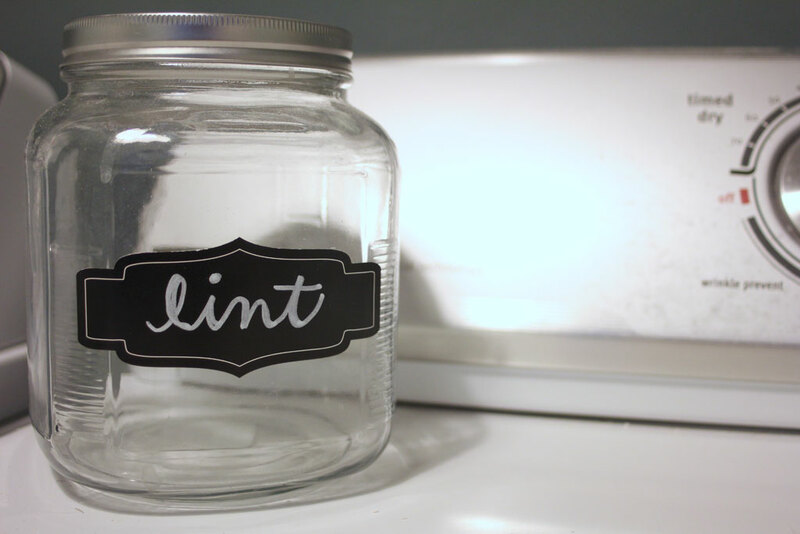 I don’t have a trash can in my laundry room, so we collect lint in a jar until it fills up and then throw it away. 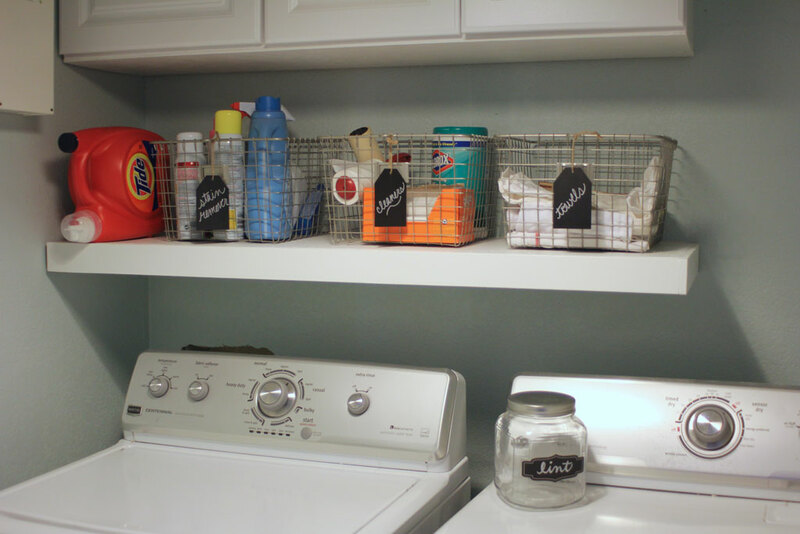 I had the jar on hand, but added the cute chalkboard tag which is a sticker (I bought those from Target on clearance for my brother’s shower, they came in packs of 6 and I LOVE them… I wish I’d bought more!). 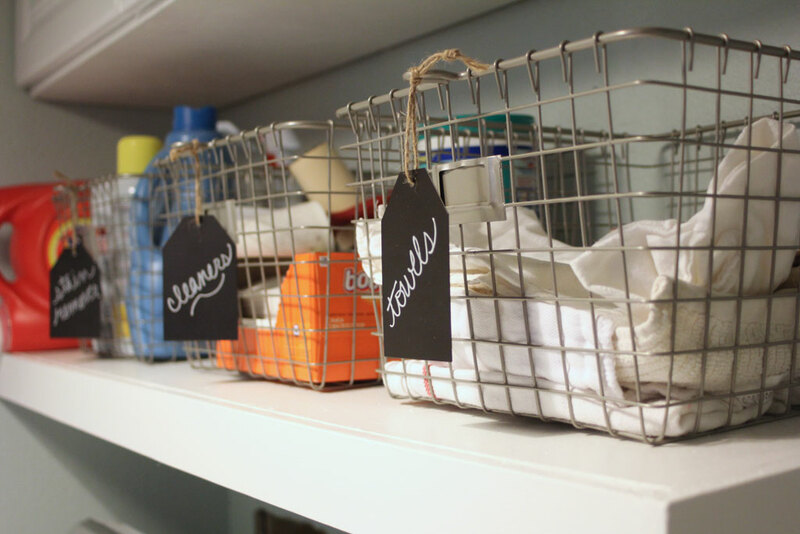 And I love these little metal chalkboard tags that I picked up at the Frisco Mercantile, which is a local warehouse where people have booths. If you live in Dallas and haven’t been, they have a ton of cute things! And just because I love them so much, here is a before and after shot for you! I love reading your posts! You and the husband are great models, not to mention inspiration, for being able to work together and still stay married ;-). Good shout out for Frisco Mercantile, too. Daughter Sarah and I love shopping there! Holy cow! I am impressed with you! Where did this Marynell come from? !